I Can Have Conversations With You app is a social language therapy system that teaches children with autism how to begin a conversation, maintain one, and end one in a much better capacity than before. The app teaches children gestures and body language, how to understand and express words, and feelings that might occur during a conversation with someone and to handle them. The app is designed to help children with conversation and social skills. The app provides a unique solution to parents who want to empower their child to initiate, understand, and participate in conversations. An easy-to-follow, self-explanatory program engages the learner’s interest within a fun, supportive environment so that learning to communicate is naturally reinforcing. The app is not only effective for learners with autism, but can help so many children with PDD, Asperger’s syndrome, or social (pragmatic) communication disorder. What if your child with autism could have better conversations with you and others by knowing what people are thinking and feeling? He or she now can! I Can Have Conversations With You!™ is a new comprehensive iPad app that features a proven method that makes the biggest, most immediate impact on language and thinking skills. This highly-praised app has been designed for concerned parents like you who want a rewarding, affordable way to boost understanding and expression for their verbal child with autism. 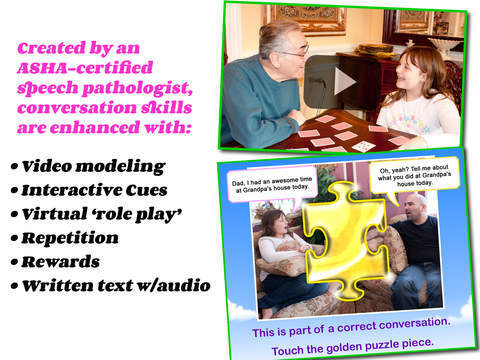 Packed with videos, photos, audio clips, reward screens, and interactive cues, I Can Have Conversations With You! is a must-have app for kids who struggle with the words, gestures, and feelings that others are expressing. Whether it’s with family members, classmates, or community members, it will steadily increase confidence - and the correct word choices - for every conversation he or she has! 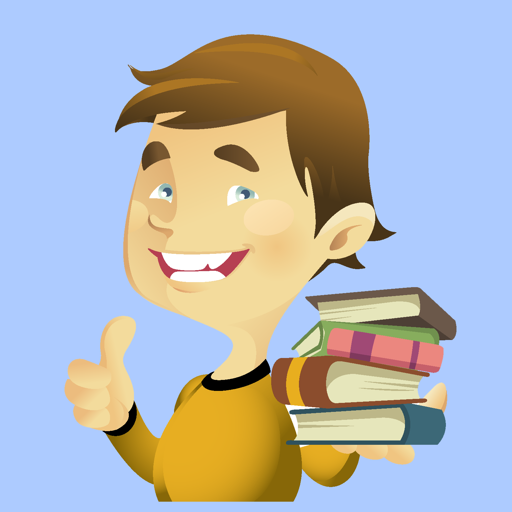 If your child is 6 or older, speaks in sentences, and can read, don’t wait any longer. Build-up the crucial language and skills he or she needs to communicate with ease and pride. DOWNLOAD IT TODAY! PRAISED by parents and therapists! TouchAutism: "I was very impressed"
Simply Speech: "This app is very comprehensive"
SmartAppsForKids: "I am so thrilled to have this app"
Steve Italia (5-star App Store review): “[My son] absolutely loves the app and asks for it all the time." I Can Have Conversations With You! is effective for verbal learners with autism, PDD, Asperger's syndrome, or social (pragmatic) communication disorder. 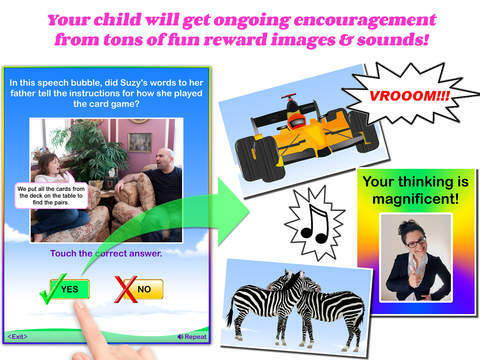 With all of this packed into one app, you'll be startled at how much your child will absorb, retain and enjoy! IT'S MUCH MORE THAN JUST AN APP. Your child's learning journey begins with this app: Conversation #1. After his/her work is completed and scored, the system selects the next conversation at the skill level that best matches his/her unique abilities. The learning continues as you download conversation #2, 3, 4, and so on. Karen Kabaki-Sisto, M.S., CCC-SLP is an ASHA-certified speech pathologist who has devoted the last 10 years perfecting a special technique to enable people on the spectrum to connect socially like never before. She is ecstatic to improve countless lives - including your child's - with her ground-breaking app! Life-Changing Results are Possible...START TODAY!